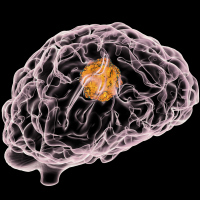 Brain tumours are considered the biggest cancer killer of children and young adults, according to healthcare experts. The news was revealed in the wake of Harry St. Ledger's diagnosis shortly after New Year. The Hampshire-based six-year-old's mother voiced her outrage this week after being told Harry will have to travel to London to get the radiotherapy treatment he needs due to a lack of radiotherapists in his home city. The youngster is being supported by national charity Brain Tumour Research, which funds a network of Centres of Excellence, including its flagship at the University of Portsmouth, where scientists are working on improving treatment options and on finding a cure for the disease. Katie Sheen, the charity's research manager said: "DIPG is a specific type of brainstem glioma which usually occurs in children between five and seven, it makes up 15% of all brain tumours in young children. "The cells infiltrate the surrounding nerves and are very difficult to remove surgically therefore the treatment that is available is limited. "The standard treatment is radiotherapy which can improve symptoms in the short-term." She explained that brain tumours are indiscriminate and could affect all ages. "Brain tumours kill more children and adults under the age of 40 than any other cancer, yet just 1% of the national spend on cancer research has been allocated to this devastating disease," said Ms Sheen. Harry's mother Fiona Lear said: "I am shocked to learn that brain tumours are the biggest cancer killer of children and adults under the age of 40, yet so many people still think it is leukaemia which is killing more of our precious children than any other form of this hideous disease." Harry and his father, Cairan St Ledger, who runs HSL Outdoor Cleaning, are avid Portsmouth FC fans and season ticket holders. The family say they have had "wonderful" support from the club, including a home visit from Harry's favourite players Conor Chaplin and Kal Naismith. They are documenting his story on their Facebook page Helping Harry's Journey. Brain Tumour Research is urging people to support National Brain Tumour Awareness Month this March - which culminates in Wear A Hat Day on Thursday 29 - when individuals, families and businesses across the UK will help raise funds to fight the disease. We offer specific cancer insurance packages for traveller's suffering from cancer.